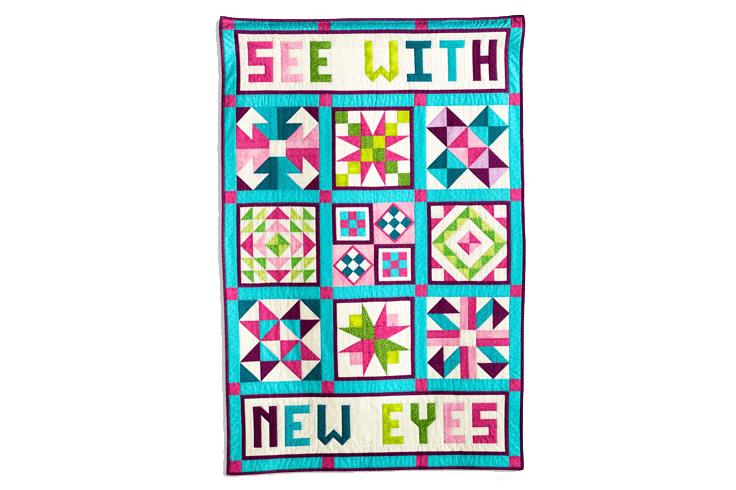 This quilt gives practice in seeing things in a new way. There are nine quilt blocks in the body of the quilt. The center block shows the simplest quilt design, the nine-patch or checkerboard. In a two color, blue/pink design, the block looks different depending on whether five of the nine squares are pink or blue and the entire checkerboard takes on a new appearance when set on point as a diamond instead of a square. In the remaining eight blocks, there are four sets of pairs. In each case the same quilt block is colored two different ways to give different appearances. Can you find the pairs? Can you see your life from a new angle?